Dr Dias is the director of Complete Care Health, a close-knit group of allied health professionals. This multidisciplinary team works out of 4 metropolitan clinics located in Ellenbrook, Wembley and Innaloo and Maddington. 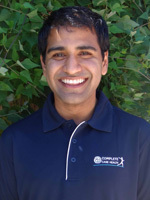 Dr Dias received his Chiropractic Degree from Murdoch University in Perth. He has had a lot of experience in various settings. He has worked in regional Western Australia (Bridgetown / Manjimup), Perth CBD and the Hills. In 2007, he travelled to India with a team of chiropractors and health professionals who provided healthcare to communities near Darjeeling and Siliguri who had limited access to medical and health facilities. His approach to treatment and management is evidence-based and patient-centered. His areas of specialty include headaches, dizziness, jaw pain and chronic pain. Dr Dias’s patients range from professional athletes and performers, to motor vehicle accidents, work injuries, children and geriatrics. Dr Dias uses specialised chiropractic techniques including Diversified, Gonstead, SOT, Drop Piece and Activator. These techniques can be performed by hand or with the aid of mechanical instruments. Dr Dias combines his chiropractic therapy with kinesio-taping, rehabilitation and physiological therapeutics (including ultrasound, electrical muscle stimulation and micro current). He is also skilled in soft tissue therapy, including myofacial release, dry needling and trigger points. He has had vast experience working with various musculoskeletal conditions and is dedicated to providing the best care possible. He works collaboratively with other health professionals and spends the necessary time to manage difficult and complex cases.